It started in October 1994 after a match in the relatively new Premier League. Mark Perryman and myself, friends and activists in the recently defunct British Communist Party, were in the habit of reciprocating hospitality after each of the fixtures between (his) Tottenham and (my) QPR. On this occasion, after a fairly dull 1-1 draw at White Hart Lane, our thoughts back at Mark’s house turned to the politics of football. The conversation went something like this. ‘Football has become a global business’. ‘But it’s the ‘people’s game and part of popular culture’. ‘The cultural is political’. ‘The art of politics’. ‘Remember the Marxism Today T-shirts?’ ‘Not a T-shirt. A football shirt! 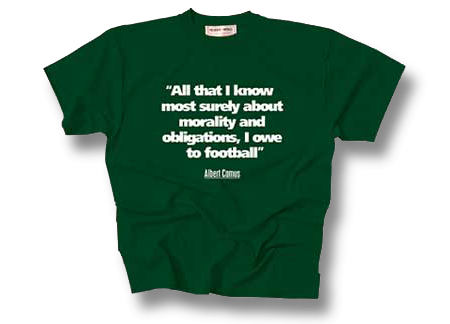 After such humble origins, Philosophy Football grew rapidly, with the early shirts (sold from Mark’s kitchen table) adorned with the existentialist thoughts of Albert Camus, the socialism of Bill Shankly and from Eric Cantona – then at the peak of his career with Manchester United – the famed ‘sardines’ rebuttal to journalists. From this point on, Philosophy Football developed its critique in two ways; a celebration of the beautiful game in defiance of the motives of big business and by opening up new spaces for dissent. On the first aspect, it was the shirts themselves - as the current CamusCloughCounter Culture exhibition at Rich Mix testifies – that captured resistance to official corporate sponsorship. The imaginative creations of designer Hugh Tisdale, these ‘cotton cult-shirts of intellectual distinction’, have found their own niche among a growing dissident fan network. Eliciting legal challenges from Umbro – until they realised PF didn’t have any money – the skilled craftsmanship behind the shirts serve as a modern day endorsement of William Morris’s ‘art for the people’ principle. The beautiful game was thought the best counter to the commodification of art and culture. Tisdale, the ‘agitational typographer’, known to wear his own Morris-patterned casual shirts, has now designed hundreds of T-shirts drawing not only on the wisdom of philosophers from Wittgenstein to Wenger, but also on a critique of the values of global corporations – the ‘Don’t think, Consume’ and ‘Corporate Greed Division’ shirts come to mind. Tisdale himself has even driven a bus to Gaza as part of the campaign to break the blockade, his comrades decked out appropriately in ‘Viva Palestina’ shirts. Poignantly his own exhibition coincides with the William Morris ‘Anarchy and Beauty’ exhibition at The National Portrait Gallery. ‘Anarchy and beauty’ might sum up the thinking behind the shirts, but there is also an anarchic streak behind the political cabarets, debates and campaigns which Philosophy Football has held in support of many causes over the last two decades, notably the Spanish Civil War, the Miners’ Strike, the Hope Not Hate Campaign and opposition to the Iraq War. The events with satire and music, poetry and even – in the early days – an alternative fashion show, have pushed out the boundaries of politics and owe a lot to Mark Perryman’s brilliant organisational skills in knowing how to intervene, create interest and publicity and galvanise public support. As a result, many of the political themes that have filled openDemocracy in recent times, on what it means to be English, on the limits of nation-state politics and political parties, the commitment to building a democratic culture, the need to seek new spaces for dissent, were all played out in the development of an oppositional football culture. This oppositional culture has also, perhaps most surprisingly of all, had its impact on the pitch. For the last twenty years I have been organising Philosophy Football FC, a team which started with eleven ideologically sound players who had trouble defending inswinging corners. Since then we have won championships, hosted ‘football in the community’ events and been on many European tours, to launch the shirts of Philosophy Football’s leading dissidents, including Pier Paolo Pasolini in Rome and Jean-Paul Sartre in Paris, and to share the common cause of internationalism with like-minded teams. Recently we have helped launch ‘Three sided football’, the brainchild of the Danish artist Asger Jorn, whose critical interrogation of the alienated and repressive late capitalist society through his concept of triolectics, was an attempt to refine Marxist dialectics. This, he argued, would release new spaces beyond the constraints of the polarised two-class society which had been reflected in the organisation of conventional football. Inspired by Jorn, we designed hexagonal pitches, installed three goals on public parks and organised tournaments with the Whitechapel Art Gallery in London, the Museum Jorn in Silkeborg, and the Athletic Bilbao Foundation in Spain. We currently play in the Luther Blissett Three Sided Football League in Deptford, South London . Our most radical contribution to the ‘art of dissent’ was an impromptu midnight game on Taksim Square last year, in a brief pause from the Istanbul protests and police violence. We put down jumpers for (three) goalposts, joined with the locals and for an hour or so helped redesign the square as a place of peace and an open site of participation.